Are you curious about how and why I invented the RotoTail? Here’s the story. I started pouring plastic worms in my mom’s kitchen many years ago. There were many spoons in her kitchen, so I used them to create lots of interesting new shapes in soft plastic, to her great chagrin. Some spoons were big, others were small – and that’s how I poured my first soft-plastic spinner blade. I thought there might be something special and interesting about it, and filed that thought away. Who knew then what it would ultimately become? My mom's spoons were the genesis of the early Flying Lure shapes as well as the RotoTail itself. Amazing but true! I really should thank her properly. Years later, it hit me: Of course! Soft blades could spin if rigged the right way. So I started looking for swivels. I tried all kinds – ball-bearing to any kind of standard swivel I could find. You name it, I tried it. I even made some of my own, using a needle, plastic, crazy glue and some wooden dowels that I hollowed out and sharpened so I could stick them in plastic worms. Then I needed to attach these swivels to soft-plastic baits. Nobody had ever done such a thing, so there were no suitable swivels anywhere in existence. 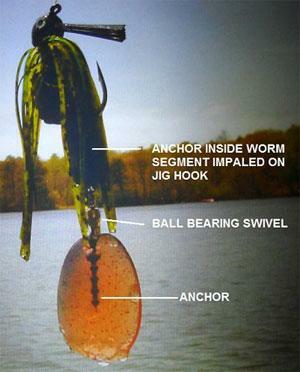 So I had to jury-rig swivels onto contraptions that were made to attach Texas-rigged hooks to plastic worms. A photo of one of these original prototypes on the back of a jig is shown above. Please click on the picture to enlarge it. The part you can see impaled inside the translucent blade is part of a hook attachment that is supposed to go inside a worm. It’s connected to a ball-bearing swivel, which is then connected to a portion of a plastic worm. A duplicate of the anchor that you see inside the blade is inside a section of the black plastic worm. The worm itself is hooked on the jig hook. That’s a long way to go for a lure with a soft spinning tail, but but I was driven to make it work! Then I caught my first fish on the lure, the above prototype RotoTail as a trailer on a bass jig. I cast the jig near a dock, and a large bass struck the lure harder than any fish I could remember striking any jig before. It was as hard as a crankbait hit. Why? I figured it had never seen anything with that much motion in a slow-moving bait. The fish wanted to kill it! It had motion, so it couldn’t let it escape. From that point forward I kept noticing that with just about all species: They hit the RotoTail very, very hard. I noticed the same thing with saltwater species. I was throwing a RotoTail plastic worm from a dock in the Florida Keys, and a barracuda slashed his way across 40 feet of surface weeds and water in a few seconds to kill the lure! I still can’t really explain it. There’s just something about the RotoTail. Maybe it’s because it spins so perfectly inside cover and weeds and doesn’t hang up, unlike all other lures. Maybe there’s something special about that soft spinning tail. And maybe it’s just because fish have never seen anything like it before. There was only one main problem with the early RotoTail lures: The swivel was at the extreme rear of the lure, where the worm ended and the soft blade began. This made it impossible to keep the bait weed-free. What was the solution? Moving the swivel. I thought, What if we moved the swivel further to the front – much further than I’d ever tried before, like to the front third of the bait. What would happen? What if we literally split the worm in two and hid the swivel inside the lure? We could still have a swivel – in fact, a better one made just for this application. And if we segmented the tail into alternating narrower and wider sections, the tail could flex and point directly into the water flow. This was (and is!) very important. And the tail could also be shielded by a shroud that protected the leading edge of it from weeds and debris. A perfect solution! We had to totally redesign the conventional fishing swivel as we knew it. Instead of metal, we made it from plastic. Why? Unlike metal, plastic doesn’t rust, pit or otherwise gunk up. We also wanted to be able to change tails instantly, so the swivel had to come apart easily and plastic is about the only material that will let you snap it in and out without retying the lure. And since the plastic swivel didn’t have to withstand the pull of a fish, it could be lighter than other swivels. What we came up with was a swivel several generations beyond conventional fishing swivels. We’d truly designed the swivel of the future. 1. Holds soft-plastic tails onto soft-plastic lures. 2. Is easily interchangeable. 3. Is weedless. 4. Doesn’t separate when cast, when it hits the water or when it’s working underwater. So I mounted the spinning blade portion of the tail (the last part of the tail that’s a different color) at a sharp angle to the length of tail itself. Having it like that isn’t absolutely necessary, but it’s highly desirable – because the blade begins to spin right away, with the slightest current or movement of the bait. This means the RotoTail blade doesn’t have to catch the passing water flow and orient itself, which is one undesirable trait of a conventional metal spinner blade. When you begin to pull a metal-bladed bait through the water (like an in-line spinner or a spinnerbait), it needs a few cranks of the reel for the blades to catch the water, orient themselves in the right direction and begin spinning. The RotoTail works very differently. The RotoTail spins nearly instantly when it hits the water because of two things: > The blade is already poised to catch the direction of the water flow immediately by virtue of the fact that the length of the tail is already pointing in the direction of the water flow and the blade is pointed at a 90 degree angle to it, maximizing instant spinning and minimizing time for finding the proper angle, like a conventional spinner. If you use the analogy of a sailboat, the sail is already open and pointed into the wind, so there’s never a lag. > The RotoTail’s second major advantage is that all the spinning parts are made of soft plastic, which is approximately as dense as water and not heavier like metal hardware. Conventional spinner blades are made of metal only because of tradition. They were invented at the turn of the last century, reputedly by a plumber in the late 1800s, who beat metal into “spinning spoons.” The RotoTail was developed in the 21st Century with 21st Century materials. So metal spinning hardware was over 100 years old when the RotoTail was invented. The RotoTail reinvented the spinner with new materials available at the time of its invention. Why use metal if you don’t have to? Another important advance in the RotoTail is the addition of pre-molded channels through the entire length of both the head and the tails, so you can easily insert the swivel anchors and shorten the tails if you want. The channel in the 4-inch tail runs from the very tip of the nose to almost the very end of the tail where it meets the soft-plastic blade. The same is true with the 2-inch tails. So you can make the tail just about any length by ripping off forward sections. You just have to leave enough of the tail in place so that the anchor (or arrow) of the swivel can impale the tail. You can rip the first three sections off a 4-inch tail and be left with just the last section before the blade. You can even rip off the nose (front half) of the 2-inch tails and be left with just the narrow part of the tail, which is barely thicker than the channel that holds the arrow of the swivel. That’s how the RotoTail was born – a soft-plastic bait with a soft, 360-degree spinning blade that doesn’t twist your line or get hung up. For the first time in the history of fishing it became possible to cast a lure right into the thickest, nastiest cover with impunity, and show big, formerly hard-to-catch fish a lure they’ve never seen before. That’s what I wanted in the first place. And a short decade later, we had it. We could hold it in our hand and smile, just like you will!